all kinds of logging activities. SpyShelter guards your registry, physical memory (RAM) and other sensitive computer parts along with processes, so that malicious code cannot be injected to take control of your PC. 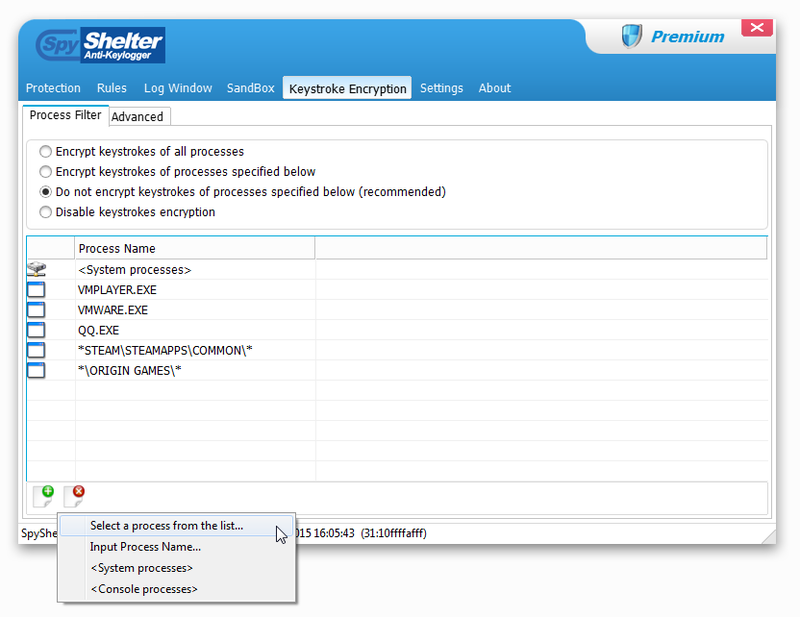 SpyShelter has an integrated keystroke encryption driver which encrypts all of your keystrokes in real time. This means that even if you allow any malicious application to run on your system, it will only retrieve meaningless random text. 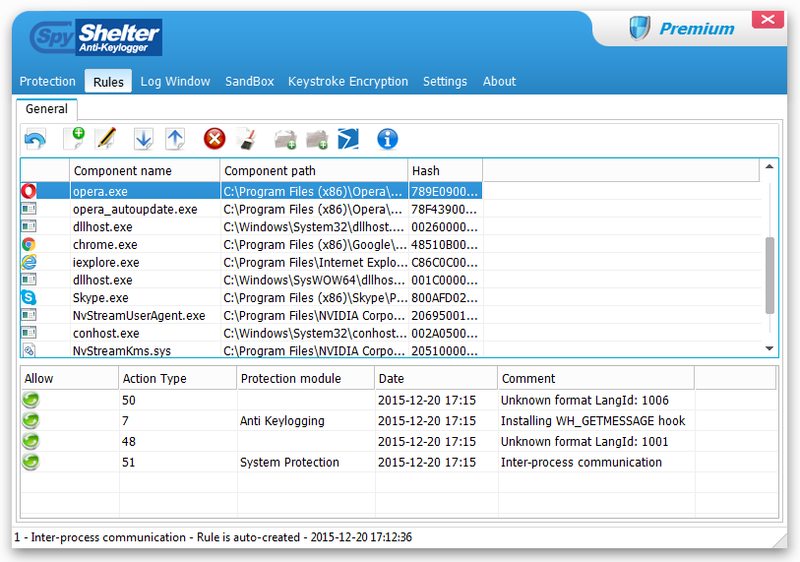 SpyShelter’s built in special Restricted Apps module allows you to restrict access of chosen applications to system resources. It increases chances of blocking attacks launched through holes in applications and limits access for recording keyboard input, getting screenshots, shatter attacks, and more. You may also be interested in SpyShelter Firewall, which combines all the features of SpyShelter Premium with a complex Firewall solution, allowing you to gain even more control over your system. In today’s modern, information based world, computers and other various mobile electronic devices are the backbone of the information hub. People can connect to each other anywhere in the world at any given time. Unfortunately, as useful as the internet is, it can be a very dangerous place. People’s lives can be destroyed by a hacker who gains access to personal data such as bank account information and social security numbers. In order to prevent identity theft, monetary loss, or even fraud from occurring; you must invest in protection for your system. SpyShelter Premium is here to safeguard you against hackers who use variety of methods to gain your personal information. Whether they try to insert a Trojan virus, hack your webcam, or listen in on your conversations, SpyShelter will protect you from all the threats of today’s digital world. SpyShelter can protect you against attacks that happen even when you do ordinary computer tasks like: writing documents, chatting with friends, capturing screenshots, opening files, and visiting websites. It is active all the time making sure that you are safe. SpyShelter monitors susceptible and weak spots in your computer system, in order to ensure that even the most advanced keyloggers are shut down even before these can launch a single dangerous attack against your computer. SpyShelter will increase your overall PC system protection against rootkits and allow you to surf the web without fear of being watched. SpyShelter has long been an industry leader at providing you with the highest digital security possible as evidenced by the long line of outstanding features offered in our products. Starting from 29€ a year. License to use the software beyond the 14-day trial.